Cyanobacteria evolved an efficient inorganic carbon metabolism (CCM) that allows Rubisco to work under saturating CO2-conditions. 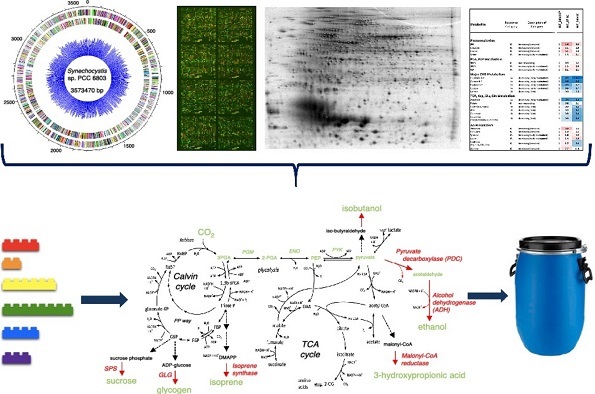 Nevertheless, the photorespiratory metabolism remains essential for cyanobacteria under ambient air conditions to remove toxic byproducts of the Rubisco oxygenase reaction. Our transcriptomic and metabolomic results have revealed that the acclimation to low CO2 (LC) conditions involves the coordinated up-regulation of many genes mostly encoding for components of the CCM and many other proteins. These expression changes are accompanied by characteristic shifts in metabolite pools; among them many photorespiratory intermediates were transiently accumulated. The transcript and metabolic patterns of wild-type cells were compared to mutants defective in the CCM to support the role of metabolic signals such as phosphoglycolate as potential signal molecules. In addition, I will discuss other signals that might be involved in the sensing of LC conditions, such as the newly discovered PII-like protein SbtB. Our studies will inform the generation of artificial photorespiratory pathways, which are supposed to work without CO2 loss or can even fix additional CO2.